Widely acclaimed for his role in creating the field of Mind-Body Medicine, Dr. Emmett Miller continues to apply his innovative thinking in the development of new approaches and techniques of Integrative Medicine, psychotherapy, wellness, stress management, psychoneuroimmunology, meditation, guided imagery and self-hypnosis for optimal health and performance. Dr. Miller spent the major portion of his youth in the inner city of New York, an experience that gave him endurance, strength, and compassion. Confident that he could make a significant contribution, he chose an academic path, earning a degree in Mathematics, election to Sigma Pi Sigma, and admission to the National Physics Honor Society. His area of special interest— systems thinking and transformation— together with his computer training, proved to be instructive in his later work. Driven by a deep desire to learn more about the mysteries of life, his interest wandered from the “hard” sciences to the study of medicine. Frustrated that the practice of medicine was still anchored in a Newtonian-Cartesian logic paradigm, Dr. Miller posited: “What would happen if human health was approached from a more complete perspective? What if we used a paradigm more consistent with post-Einsteinian understandings that had so fundamentally transformed every other field of science?” Following his medical training at The Albert Einstein College of Medicine, Dr. Miller opened his practice of Primary Care Medicine in Northern California in about 1970. During his clinical work following medical school, Dr. Miller realized that mental, emotional, behavioral, spiritual and social factors all play a crucial role in human health and disease. When these are directly addressed in health care, healing is faster and more complete. What’s more, a large portion of our illnesses can be prevented! As radical as that sounded at the time, Dr. Miller changed millions of minds (and bodies) over the next two decades through the use of self-healing tools he developed himself. Now in the 21st century we (including the slow-to-change medical profession) realize that most of our illnesses and dysfunctions are not caused primarily by external factors (such as infections and injuries). The true source is our thoughts and attitudes, emotions and reactions, expectations and stresses – and the behaviors they cause or inhibit (e.g., addictions, exercise). Our health care system is in severe trouble because it still fails to recognize the missing ingredient: the mental, emotional and spiritual participation of the patient in the process of healing and illness prevention. This led Dr. Miller to embark upon a unique path — that of teaching his patients self-healing skills and ways to enhance performance. In the early 1970s, Dr. Miller published his first book, Selective Awareness, firmly establishing him as one of the founders of modern Mind-Body Medicine. In this groundbreaking work, he introduced the medical and psychological professions to a new paradigm, going beyond the Newtonian-Cartesian approach to human health then in vogue. He continued to explore beyond the limits of mainstream medicine, which often employed shortsighted attempts to treat disorders and imbalances by simply removing, adjusting, or replacing malfunctioning parts — as if humans were simply complicated machines. His holistic viewpoint envisioned human beings as whole systems in which an imbalance in one level (physical, emotional, mental, spiritual, or behavioral) could be caused, healed, or prevented by changes at other levels of the system. Similarly, self-healing, the resolution of the illness, could be initiated through bringing balance (homeostasis) to the system as a whole. Because this healing process is best guided by the highest levels of the mind/body complex— the conscious intellect— he reasoned that what was needed was a way to release excess stress and tension and focus the mind, free of distraction, on the appropriate series of thoughts and images. This led to his development and integration of a powerful set of healing tools which included deep relaxation, hypnotherapy, guided imagery, movement and music therapy, meditation, and cognitive behavioral and self-affirmation techniques. By utilizing the newest recording procedure of the day and turning it into a new healing tool, Dr. Miller recorded his voice, along with music and sounds of nature, onto an audiocassette. In this way listeners could be guided into deep states of stress-relieving relaxation whenever they wanted. With relaxation giving access to the “programming” level of the deeper mind, listeners could access their emotions and spiritual resources to create imagery for self-healing. The healing potential of this approach has been widely documented in subsequent controlled studies. These original recordings by Dr. Miller, as well as many more are available as CDs and MP3 downloads at ShopDrMiller.com. In 1970, while Dr. Miller was practicing Family Medicine in Carmel, CA, his interest in the role of the mind and emotions in human disease and dysfunction led him down the Big Sur coast to the Esalen Institute. Since the 1960s, Esalen Institute has been a world leader in bringing the wisdom from Eastern meditative and body-oriented disciplines to the West and challenging the usual “medical model” that sees the mind and body as being separate (the Newtonian-Cartesian paradigm). The freedom and openness he found at Esalen provided a uniquely nurturing environment, and one that proved a welcome contrast to the rather chilly reception accorded his mind-body concepts back in those days. There, Dr. Miller formed a prolific partnership with Esalen co-founder and director Richard Price. Together they began teaching seminars and leading workshops combining his approaches with the Gestalt techniques of Price. At Esalen he had the opportunity to connect with many remarkable healers, including philosopher Gregory Bateson, Alan Watts, Moshe Feldenkrais (inventor of the Feldenkrais technique), Milton Trager (Trager body work), Ida Rolf (Rolfing), Chungliang Al Huang (Tai chi), Gabrielle Roth (dance and movement) and other prime movers in the body and spirit-centered therapies. Their influence can readily be found in Dr. Miller’s approaches. 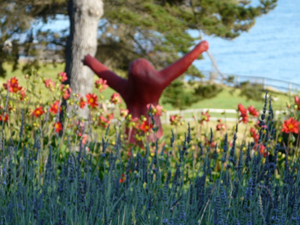 Dr. Miller still offers seminars at Esalen. In 1977, Dr. Miller founded the Cancer Support and Education Center with Maggie Creighton, (who had formerly designed the original training programs for Carl Simonton, MD), and oncologist William Buchholz, MD. Together they started the world’s second (after Dr. Simonton’s) center for teaching relaxation and guided imagery while providing group support and self-management/self-healing skills and the first center to train healthcare practitioners in how to share these tools with cancer patients, medical and nursing students, etc. Now ALL modern hospitals include such counseling and groups in their outpatient care departments. In 1975, Dr. Miller met Sandra Ferreira, who soon became his life partner and co-leader in workshops on bodywork, meditation, Ayurvedic medicine and massage therapy. She continues to be an inspiration and treasured supporter/helper in his work. Their daughter, Aeron was soon born and continues to light up their lives. She now serves DrMiller.com as webmaster and graphic designer; without her this beautifully designed and executed site would never have happened. 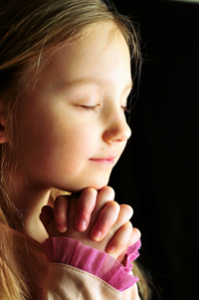 Dr. Miller soon recognized that many people could actually speed up their healing through prayer, belief in a higher power, or following one or another spiritual path. An agnostic scientist at the time, he nevertheless found himself drawn to the study of numerous spiritual and religious disciplines, including Buddhism, Hinduism, Christianity, Judaism, Kabbalah, and Taoism. Even though there are major differences between any pair of these religious institutions, what they have in common is even more significant. Beyond the dogma he saw a shared pool of wisdom and similar processes for accessing deeper spiritual and health resources. Regardless of the denomination, these processes always involve learning how to enter a state of consciousness characterized by deep relaxation, feelings of safety, a focus on the present, and the ability to impact normally involuntary behaviors and change belief structures. 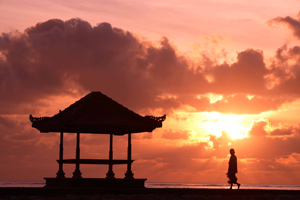 These states are often referred to as meditation, prayer, trance, or contemplation. Dr. Miller’s goal became to refine these time honored techniques and organize them scientifically. He then integrated them with standard tools of medicine and psychology to create a holistic approach: one that would treat body, mind, emotion and spirit as an integrated whole. He found that when a patient or client is offered specific sequences of suggestions given in the form of guided imagery, there ensues a deeply relaxed state similar to that reached during hypnosis, meditation, prayer and guided imagery. Dr. Miller was convinced that these new discoveries could lead to a virtual revolution in health care, accelerated healing, greater happiness, and a deeper and richer experience of life. He then dedicated his life’s work to sharing these discoveries with the world. Over the next 20 years, while developing his practice and lecturing at numerous universities and medical schools, Dr. Miller broadened his perspective. He focused on creating strategies for achieving high-level wellness, peak performance, and for applying new approaches to healing and behavior change in families, groups and organizations. He worked with many athletes and his programs were used by numerous Olympic teams. Dr. Miller’s work with colleague, Virginia Satir, creator of the field of Family Therapy, led to an expansion of his theories and practice as he integrated her profound and compassionate concepts of collective healing. To explore the effects of applying the principles of healing Dr. Miller joined forces with Dr. Juanita Brown and a highly regarded group of organizational development specialists. Together, they developed strategies (Evocative Technologies) for catalyzing second order change in corporations, government, and education through the use of emotional accessing, guided imagery, and collective intelligence. Some of those explorations are reflected in such current movements as The World Café. During this time he authored several other books, including, Feeling Good; How to Stay Healthy, and Software for the Mind, which introduced the theory and practice by which the human biocomputer can be self-reprogrammed. By the 1990s, Dr. Miller’s expertise had been discovered and put to use by such performance-oriented entities as the five time Superbowl champions, the San Francisco 49ers and the U.S. Olympic Track and Field Team. Dan O’Brien, “World’s Greatest Athlete,” made use of Dr. Miller’s tapes on the way to his Olympic decathlon gold medal performance in 1996. 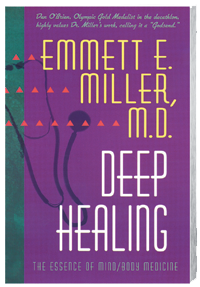 In 1997, Dr Miller published Deep Healing: The Essence of Mind/Body Medicine, the classic text presenting the harvest of 30+ years of work studying the process of human healing. Dr. Miller’s vision for the future includes using the World Wide Web to share his discoveries and healing tools with as many people as possible, for as low a cost as possible. He believes we have the ability to prevent the disasters we keep inadvertantly creating. His work is to provide tools to help in this process at the cultural and global level. Dr. Miller now coaches clients and sees patients in his offices in the foothills of the Sierra Nevada (Nevada City, California), and in Los Altos (San Francisco Bay Area), by appointment. He continues to produce experiential audio and video recordings that are widely recommended by caring health professionals world-wide. His tapes, CDs, and videos are in daily use at Kaiser Foundation Hospitals, the Mayo Clinic, and are featured by McGraw-Hill in their stress management texts, in use in university courses. Dr. Miller also speaks at conferences and offers workshops and seminars on many topics in his field of expertise. Phone and Skype appointments are also available. Dr. Miller’s classic book, Deep Healing, the Essence of Mind-Body Medicine, provides not only an excellent training guide to heal and empower your mind/body software, but also gives a personal glimpse to Dr. Miller’s professional journey over the last 30+ years in the field of mind-body medicine. More recently, Dr. Miller has taken on the task of applying his successful healing tools at the individual, family, and group level to higher levels of systems. For example, His book, Our Culture On The Couch – 7 Steps to Global Healing, presents his perspective on our global situation, and a practical way to participate in the global transformation now taking place. You may listen to Dr. Miller read excerpts from this book here. When not directly engaged in facilitating healing for individuals, teaching, or public speaking, Dr. Miller is an avid photographer and videographer, musician, and active participant in the lives of his three remarkable children, of whom he is inordinately proud. On vacations he loves to travel, and at home he spends as much of his free time as possible walking in the hills and sleeping under the stars. Here on DrMiller.com you can get more information, schedule an appointment in person, by phone or Skype, register for a workshop, see the schedule of upcoming events, or book Dr. Miller for your group. You can also email us or call (530) 478-1807 or FAX, (530) 478-0160.